Due to a flaw in the genetic engineering designed to prolong the life of the population, men only live to 25 years of age, and women only live to be 20. Because of this, teen girls are taken from their homes and given as brides to wealthy young men in hopes of keeping the human population alive. Sixteen-year-old Rhine has been in hiding with her twin brother since their parents died. But when bride snatchers kidnap Rhine, she is married off as one of three brides to aspiring architect, Linden Ashby. Imprisoned in a world of illusions and beauty, Rhine’s “sister wives” begin jockeying to be Linden’s favorite, while all Rhine wants to do is go home. Now she’s caught between a life of luxury with Linden—who genuinely seems like a good guy—and the desire to escape her gilded prison for the perils of living on the street. 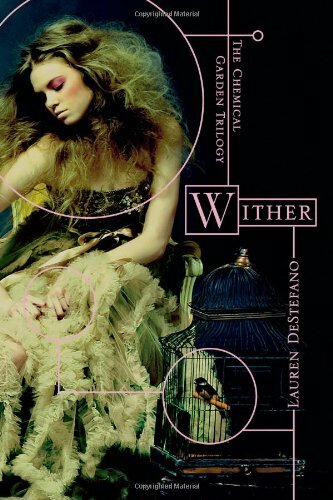 Wither by Lauren DeStefano is the first in an unconventional (although predictable) romance trilogy that takes place in the dystopian future. Readers will find that it lives up to the hype as one of the most anticipated young adult releases of 2011. Like many recent, popular YA releases, Wither features a strong-willed, female protagonist; however, unlike many her peers-in-literature, Rhine’s story isn’t one of self-discovery. Instead, it’s the story of a genuinely headstrong young woman struggling to keep hold of the person she always has been, and wants to remain for the rest of her doomed life. Readers are presented with a skewed presentation of reality, as the story is told entirely through Rhine’s eyes. This mode of narration provides a visceral, but limited representation of the world of Wither. At times readers will feel as though they’re only getting a single piece of the puzzle, but of course, this may be an intentional ploy on the author’s part, as it adds to the story’s allure, and allows ample room for expansion. The story itself is a bit predictable, with Rhine’s romantic tendencies showing through at the beginning of the book. Attentive readers will guess the main arc of the book early on in their reading. But the nuances of the main story, and the subplots woven around Rhine’s sister wives and their collective husband, keep things interesting—not to mention the many descriptions of technological and medical advancements that seem freakishly realistic to be merely fiction. Hidden beneath the glossy veneer of subtle science fiction, Wither deals with human trafficking, domestic slavery, and polygamous marriage cleverly disguised as the last refuge of the human race. DeStefano has done an excellent job dealing with the delicate nature of such subjects, all while preserving the edgy and sometimes frightening reality of Rhine’s circumstances. DeStefano’s writing isn’t challenging, but it does help readers establish an emotional relationship to the main character and her surroundings. She is generally straightforward, without just giving us a cut-and-dry story, and doesn’t resort to condescension in an effort to please the younger crowd. Wither is a story of hope and love in the face of impending death. It takes place in a world of ignorance, filled with people who thirst for knowledge. Rhine is a teen who knows what she wants, and is ready to stand up for those choices, whatever the cost, without becoming unbelievable in the reader’s eyes. All in all, DeStefano has written a poignant and satisfying teen romance that is sure to spawn many sequels. Wither is poised to take the market by storm; it’s just what the YA genre needs. J. P. Wickwire is an author of speculative short fiction and verse whose work has appeared in a number of publications including Vicious Verses and Reanimated Rhymes and Bull Spec magazine. Her short fiction appears in the November/December 2010 issue of Cicada magazine.